Life memories create history! 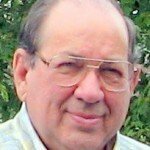 History– both good and bad–to pass on to those that follow. To those that follow, who are wise enough to heed and adapt that historical experience to their own circumstances, the history can be very beneficial and provide guidance for navigating the pitfalls of life. It can even be entertaining in many cases. The below snippets of my wife’s life experiences are written and provided on this website in the hope that they may be both informative and entertaining to the reader. They are a collection of separately written articles, in most cases, of memories and experiences. yet always had such a positive outlook on life. with their love for us and their successes in life. To my children, Lorri and Alan, and granddaughter, Amanda, and any descendents who may follow, this memoir was written for you; written so that you may know more about those who came before you–at a different time and place. Most of the entries in this book were composed from my own personal memories of my life. Some other facts and references were passed down from my parents. I was not fortunate enough to know any of my grandparents. I was fortunate, however, to have heard many stories about them from my parents. This year, 2010, the 50th anniversary of my marriage to your father and grandfather, Donald McElyea, was a time of much reflection and brought back many memories. It was during this time that I began to think seriously about trying to remember and record some of the events of my life. I know you have heard me speak of many things that occurred during my childhood and adult years. 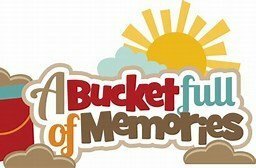 In reading these memories, I hope they will spur an interest in your wanting to know more about your family. This book is not a genealogy–that must come from another source; nor is it a collection of everything I remember–that would take up too much space. It is just some of the facts and events that I thought might be interesting and informative. We all have a life story to share. I hope you are already collecting memoirs to share in your story at a later time. I have often wondered how it was on that cold January 31, 1938 night. Was my mother afraid of what was about to happen? Did she worry that my father would not find the doctor at home and that he would not get back in time to deliver her baby? Was she afraid of complications? This event was playing out in the small town of Hartselle, Alabama. My mother, Ora Bennett Orr Templeton, was 43 years old and this was her first child–unusual in those days. I’ve heard her say that her sister, Berta (who herself had bore 9 children), was concerned about this “late in life” baby. My mother had first been married at the age of 17 or 18 to a handsome young farmer, Robert Orr. They had bought (or built–I’m not sure which) a home in Hartselle with 15 acres of land. They had been married about 10 years, with no children, when Robert became ill with tuberculosis. As the disease progressed, Robert made the long trip to Arizona by train, hoping that the dry air of that region would help. He returned in a few months, resigned to the fact that he would not get any better. He died soon after, leaving a heartbroken young widow. Soon after Robert’s death, my mother rented out the home they had purchased and moved into the house with her parents, Joel Forrester Reuben Bennett and wife Martha Ellen Bennett, who lived on a small farm near Danville, Alabama, about 10 miles from Hartselle. I will add here that Ora was the youngest of their four children–an age span of 20 years between the oldest and my mother. For the next 15 or so years, my mother lived with her parents, caring for them as each one grew sickly and required care. During those years, my mother worked very hard on their farm, raising food in their garden, caring for the animals, milking the cow, raising chickens, and all the many chores that go along with farm life. I’ve heard her talk many times about getting up before daylight and getting vegetables ready to take to the curb market in Decatur, Alabama which would have been about 10 miles away. She drove a Model-T Ford. Somehow, I never did learn how they came to have the car. There surely was not very much money during those days. She also went back to school during those years. I even have some of the text books she used. One of the teachers at the school boarded with them for several years. She was an artist and drew a portrait of Joel Bennett, which I have in my home today. During some of those last years caring for her parents, I suppose she was being courted by several suitors, one being my father, Walter Urby Templeton, a bachelor, 12 years older than she, who worked for L&N Railroad. I never knew how she made her decision, but my dad was her choice, and they married soon after the death of Joel Bennett in 1936. They then moved to Hartselle to the house she had left some 20 years before and began their life together. So now we are back to that January 31 night in 1938. The doctor was at home that night. My father was able to get him to our house in time. There were no complications. I can close my eyes even now and smell them and see their brightness as they billow in the breeze. I can still feel their roughness as I pulled them around me in the evening. Maybe you already know what I’m talking about–sheets hanging outside on the clothesline to dry–something that is rarely seen in this year 2010. In my growing-up years, wash day was an all-day event. Unlike today, washing was not done every day or so, nor were clothes washed after every wear. When they were sufficiently soiled, the clothes were collected and usually on a particular day of the week they were washed. My very earliest memories of wash day were those of the laundry being washed on a rub board and then boiled in an iron pot out in our back yard. An elderly black lady (Aunt Penny) would come on wash day and help my mother with that. I can also still remember the terrible smell of the lye soap that was used in those days. But then the clothes were hung on that old wire clothes line, pinned with weather-worn clothespins, and left to dry in the sparkling sunshine and summer breeze. In the years to follow, we graduated up to having the old round tub washer with the wringer attached. It was electric but it required that it be filled with water (drawn from the well on the back porch) and that a galvanized tub be placed next to it on a box and filled with rinse water. Our inside plumbing and running city water were to come a few years later, a grand event. Following wash day, came ironing day. That, too, was sometimes an all-day event. Somewhere along the way I became the chief ironer, which I really did not mind, except for my daddy’s long-sleeve shirts. There was a procedure to follow with the ironing. First, for those pieces that had been starched, those had to be sprinkled with water. This was done using the little sprinkle bottle with the little holes in the top. After sprinkling the piece of clothing, it was to be neatly rolled up and placed in the refrigerator for a few hours. This made it easier to iron, leaving it crisp and smooth, with a lovely scent from the starch. Ironing day actually became enjoyable for me. I would set up the ironing board on our big screened-in back porch, listen to music and my favorite day-time stories on the radio. Then there was break time for lemon ice cream which my mom always seemed to have in the freezer on that day. As I look back on those days, they did make special memories. If I were not telling this story, you might never have known of those “historical days” before the modern conveniences in my childhood home. I am thankful for the wonderful inventions and timesavers of today, but I also treasure those times when life was so simple and the days were long and sometimes lazy. “Temp,” my mother would say (that’s what she called my dad, being that our last name was Templeton). “Temp, I wish you wouldn’t do that, it makes me too nervous.” The situation that was making her nervous was that my dad was letting me (at age 9 or 10) sit in his lap and steer the car. This had become a regular Sunday afternoon event when we went out in the country to visit relatives. Let me add here that this was a 1938 Ford which was hard to steer and hard to stop. Little did my mother know or anticipate that my learning to drive at that early age would be a blessing for us in a few short years. When I was 12 my dad had a serious heart attack and he died a year later when I was 13. Suddenly, we were thrown into a situation where my mother had to find a job and she did not drive (even though she had driven that Model T Ford in earlier days). By this time my dad had taught me to drive, but of course I had never actually gone out onto a road and driven without him being with me. In the next few months I became quite proficient in that old ’38 Ford. My mother was able to get a job and I would drive her to work in the mornings and pick her up after school. We had a conversation with the Hartselle Police Department about our situation and were assured that I would not be stopped for driving without a license. So for three years I drove that old car and it was a happy day when I got my official driver’s license. Soon after that we did get a little later model car and I drove that all during high school. Because of my father’s death, finances were pretty tight during my high school years. I so wanted to go on to college and had been accepted at Howard College (now Samford University). But that just wasn’t to be until later years and at another college. Right after graduating from high school I began working at Citizen’s Bank in Hartselle. To soothe my disappointment at not getting to go away to school, I promptly went to the local Chevrolet dealership and purchased a beautiful black and silver 1957 model. The monthly payment took a big chunk out of my paycheck from the bank but when I was driving that car I didn’t think about the payment. That same car went on to be the one that transported our first child around town–first in a red laundry basket on the seat beside me and later in a “hook over the back of the seat” carrier. It would pale before the luxury car seats of today. As I look back over the years I don’t really know how many cars we have all had. I guess I could remember them all if I really tried. But, in truth, that first old car…the 38 Ford…the one that I was often ashamed of, still has special memories. It was there for us when we needed it most. It stood majestically in our back yard. At least in my mind now as I think about it, it seemed majestic. And certainly in my childhood, it was. I don’t know how long it had been there when I first began to love it. Perhaps 20 years, because it was already tall and wide …tall enough that it towered above our house and the surrounding buildings. Wide enough to offer shade to the many activities that took place below. The trunk of the tree was quite large but was shaped so that children could easily get a foothold and shinny up to the limbs. Now, these weren’t just ordinary limbs. They were big and fat and springy, and a determined youngster could practically disappear among the branches. In fact one could eat tomato sandwiches and bacon biscuits up there and not be seen. There were limitations on how high we were allowed to climb, and those rules were only occasionally disobeyed. Attached to one of those lower limbs was a swing…a one-person swing made just for me. When I wasn’t in the tree I was often in the swing. My dad had somehow managed to attach chains over that limb and create a wonderful means for daydreaming. I’m sure some of those daydreams were about things to come….growing up, getting married, having children. Little did I know then that my first-born, Lorri Denise McElyea, would also spend time in that very swing years later. The shade of the tree offered protection from the sun as my friends and I made pretend houses and played dress-up, and had school. The dog very often was also dressed up, much to his distaste. His name was “Lucky.” My mother seemed to always cooperate with our desire to drag stuff from inside out under the tree. Many hours were spent there in our make-believe world. But everything that went on beneath the tree wasn’t all fun and games. In my growing-up years, there was a lot of work that had to be done…and of course without the many modern conveniences of today. My parents always had a huge garden. In those days freezers had not come into existence, so all the vegetables had to be prepared for canning. “Under the tree” was the place where a lot of the preparation was done. The corn was shucked there, beans were snapped, others shelled. The okra was cut up, the tomatoes were peeled, the cabbage shredded for kraut. Sweet potatoes and Irish potatoes were cleaned and sorted and prepared for storage. Apples and pears and peaches were peeled and cut up for canning and drying. My dad also used the shade of the tree to do his “tinkering” on the car and to do other repair jobs. And of course, as I have mentioned in an earlier story, this is where the weekly wash was boiled in that old iron pot. Today, we hear about “tree huggers” — a term used by those trying to save the trees in the forests. I think I was ahead of them. I hugged my tree way before they coined that phrase. I wrote this story for a Toastmistress speech back in the 80’s. The first part is about my mother, Ora Templeton, the second part is about me, Sue Templeton McElyea, the third part is about our daughter, Lorri, and the fourth generation girl is our granddaughter, Amanda. The year is 1912. The young wife has left the home and family where she has lived for the first 17 years of her life. She now has her own home and a new husband. Things are not easy for her, nor had they ever been. She is accustomed to hard work. The days are long and filled with many chores. She now has the responsibility of a house, a garden, and a farmer husband. She is a beautiful young woman and takes great pride in her appearance, as well as that of her husband and her home. She dresses nicely — mostly in clothes that she has sewn herself — cottons and linens and some laces, all of which require delicate laundering on the rub board and then hours of ironing. And oh that ironing!! That takes one whole day of her week. To get the smooth, crisp look of the clothes in that era, she begins early in the day to prepare for the ironing ritual. She has already spent the previous day washing and starching, and drying all their clothes and linens. Now, today, she begins by dampening the clothes and rolling them up to “season” for a few hours. She then brings wood in from the back porch and piles it into the belly of the kitchen stove, which is still warm from being used to prepare the early morning breakfast. In the summertime, the heat from the stove will push the inside temperature to well over 100 degrees. As the stove heats, the young woman places two black flatirons on top of the stove. She then clears the wooden eating table in the kitchen and spreads several quilts and a sheet on it. This will be the padding where she will do the ironing. She then begins the task by lifting up one of the hot irons using a pad to protect her hand. Quickly, she touches an index finger to her tongue and then pops her finger against the iron. If there’s a sizzle, she knows the iron is hot enough. She takes the iron over to the table and slowly and meticulously begins to push this little black piece of iron across the damp white linen fabric. Very soon that iron cools and she has to alternate with the one on the stove. She continues this throughout the day, stopping only to add wood to the stove and to cook a bit of lunch for her husband when he comes in from the field. By late afternoon the ironing is finished. The clothes are hanging in their places. The young woman takes the irons over to the hearth to cool. They will be there next week, ready to be heated, and for the ironing ritual that will again occur. The year is now 1952. The teenage girl is in 8th Grade. Saddle shoes and long skirts and starched crinolines are the dress of the day. For several years, the family ironing has been her responsibility, which she really didn’t mind because she liked to iron. It’s a summer day and she can be found setting up the ironing board out on the screened-in back porch. The radio is nearby and is tuned to her favorite music or maybe the afternoon radio soaps that she likes to listen to. The clothes have been sprinkled and neatly rolled up and placed in the refrigerator where they will be cool and damp. The electric iron is plugged in and hot – – ready to glide smoothly and effortless over each garment. Occasionally, the young girl’s mother will walk by and ask why she has re-washed and re-starched all those skirts. The daughter’s reply is “they just aren’t stiff enough.” So she, like her mother before her, completes the day of ironing, but with much less effort than those days of the old flatirons and a hot stove. Some 20 years later, in the 70’s, we find another young girl – a teenager. She has her own room, which is always a mess. She is always on the go, involved in many school and church activities. She too irons, but in quite a different way from her mother and her grandmother. She may be seen ironing on the floor, on the bed, or even on the seat of a chair – wherever there is an empty spot – and she is always doing it just 10 minutes before she needs to put it on and leave the house. The sweet smell of spray starch, now available with just the push of a button, permeates her room and down through the hall. The iron she uses has its own water spray, has a non-stick surface, even a cut-off if she forgets and leaves it on. Her mother surveys the room left in such disarray and remembers another era. Three generations of ironers — different circumstances, yet the same in many ways, in that each was demonstrating their same desire to look nice and show pride in themselves. Our fourth-generation girl, unfortunately — at least in my mind, does very little ironing. It’s the year 2010, and it’s all wash and wear, wrinkled, rolled up, cut off, and holy (not a religious term). But we love her, and she will be told about how her great-grandmother did things, and hopefully, will appreciate and treasure that knowledge. The young girl knew just when to be there. For a long time she had known the schedule — knew just when that beautiful blue and silver train would pass by. The railroad ran along the back side of her family’s property and there was a nice path down to the tracks. Whenever she could, she would run down the path and stand and wave as the train went by. The engineers would always wave back and some times even a passenger would also wave. The little town of Hartselle, Alabama, was not on the regular stop route. Occasionally, though, the train would actually stop at the depot which was just a short distance down the tracks from where she stood. When this happened, the passenger cars would be right there in front of her. Looking into the windows of the train she could see the white tablecloths and the shining crystal glasses. Men in white jackets were moving among the tables, balancing trays of food and drinks. In some of the other windows she could see people in conversation with each other and others just leaning back, resting or dozing. To her, at that time, those people seemed to live in another world. This special train was named “The Hummingbird.” The young girl, in the little town of Hartselle waving at the train, was me. From 1946 until its retirement in 1969, this train faithfully carried thousands of passengers on its route from New Orleans to Chicago. Other major cities on the route were Cincinnati, Louisville, Bowling Green, KY, Nashville, Memphis, and Birmingham. As an older teenager I did make a few train trips, but never on “The Hummingbird.” It was one of those wishes that just never did quite come true. Sadly, the fate of passenger trains in the United States continued in a downward spiral for many years until they were practically obsolete. Amtrak has tried to renew the trend, but it has been an uphill battle for them and they still struggle to survive. I was able to ride the Amtrak “Zepher” from Chicago to San Francisco a few years ago. Ironically, all along the way, children were still waving — still wondering, I guess, about the people inside — just as I did so many years ago. It has always been a little difficult to describe where I grew up. It was a small farm; yet it was in the city. It was only a 10-minute walk to the high school I attended and to the city swimming pool and tennis courts, or to the public library. The farm was about 15 acres and these other things had slowly built up around us. We had just about everything there that a large farm would have, including various animals…cows with calves, pigs, mules. Never a horse though, which I often asked for. One of my fondest memories is of our cow, “June” — a large black and white Holstein — so gentle that my parents would let me lead her out from the barn into a pasture when I was still a small child. Not sure where the name came from — whether she was born in June, or named after an unfavorite relative. “June” had a number of babies through the years that all looked just like her. It was always sad when they were old enough to be sold. The pigs were my least favorite of the farm animals. They were noisy and they smelled bad. I did always like to see the baby pigs, but they quickly grew up. We had two mules, “Ada” and “Ida”. They were used mostly to plow our very large garden and some of the field crops. My daddy loved those mules and they were rather spoiled. A comical event, at least to us, occurred one summer with one of the mules. A “city cousin” from New York was spending the day with us and wanted to see and do everything on the farm. My dad brought the mules up to the big water trough. “Cousin” had been having a fit to ride the mules, so my dad put him up on one of them. Immediately, the mule lowered her head into the trough and “cousin” went right into the water. He was the only one who didn’t think it was funny. Chickens — we always had chickens. Red chickens, black chickens, white chickens. They were never my favorites either – – until the weekly unlucky young ones turned up on our table. Fried chicken has never tasted as good as what my mother would fix. I think dogs and cats are always special memories for all of us. We really didn’t have that many during my growing-up years — I guess because they all lived so long. Our cat was big and yellow and was named “Monroe.” I was told my dad named him after an old friend. The first dog I can remember was “Lucky,” a little black and white terrier. My mother named him that because she thought he was lucky to be taken away from the owners. The other dog in my teenage years was a blonde cocker spaniel that we named “Blondie.” We found her in terrible shape as a pup and nursed her back to good health. She turned out to be a beautiful and loyal dog — still with my mother for several years after I moved away. I believe animals are God’s special gifts to us. We should treat them as such. I have written in another story about the Maple tree that grew in our back yard. It was a special part of my growing-up years. But there were other special places too. One of them was our front porch. 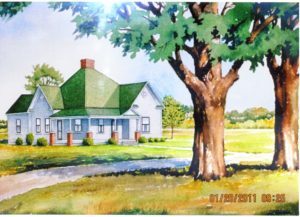 I have included a picture of a water-color painting of the house where I grew up and lived in until I left it as a bride at age 22. As you can see it was a rather large house and had a porch that wrapped around two sides. I have many wonderful memories of hours spent on that porch. Of course in those days there was no air conditioning so the porch offered sweet respite from the heat. The north side was shaded by the house in the mornings and the west side by the giant oaks in the front yard in the evenings. I can still hear those screen doors slapping as we went in and out so many times every day in the summer. The porch was a resting place after working in the garden or yard. My mother would often sit there and shell peas and butterbeans. It was a play house where my friends and I would dress up and play make-believe. It was a perfect place to curl up and read, and also the perfect place to sit and pout if I had been scolded for something. Flowers were always blooming in the long boxes that sat on the edge of the porch and all the shrubbery around the porch was blooming shrubs of some sort — butterfly bushes, roses, snowball bushes, and others with names I can’t remember — not just evergreens as we have today around our houses. It was a yearly job to paint the porch — grey of course. That was just the standard porch color. I was quite young when I learned to paint and that porch was the teacher. To this day I still like to paint. Summer evenings would find us sitting on the porch. It was much cooler there, but the mosquitoes loved it there too. My mother always had the old hand sprayer, filled with kerosene that she would spray all around us. I haven’t forgotten that smell. Neighbors or relatives often joined us for these evenings on the porch. It was like getting a history lesson listening to the older folks talk. I remember the discussions about what had just happened at Pearl Harbor and about some of the local boys being in the war. The porch saw sadness also as my father sat there for many weeks after suffering a heart attack. Later the porch would feel his casket roll over it as he was brought home for the final time. I was 13 at that time. Yes, that front porch created many memories for me and for my children. I was so glad they were able to enjoy some of those same pleasures there in their early years before the property was sold and the house dismantled. All I have now are the memories and this special painting of the house and the porch… and I do treasure these. I’ve written in another story about the front porch of the house where I grew up. This story is about the back porch which also has special memories for me. Whereas the front porch was used more for relaxing and visiting, the back porch had many other functions. This porch was a rather large area. In fact part of it could easily have been made into another room had someone wished to do that. But for the life of the house, it always remained as the back porch. In the larger area there was a long oak table — one that had been hand-made for my mother by her father-in-law when she was a newly wed. During the summer months we would often eat a meal there. But most of the summer it would be covered with beautiful tomatoes that my mother raised in her garden. People all over our small town knew about her tomatoes and would come there to purchase them. During the winter months the table just sat out there in the cold and served as a collection point for various things carried in and out of the house. I now have that table, refinished and loved, in my kitchen. The smaller part of the porch served more as the work area. It was here that the electric tub washer sat, along with the galvanized round tubs used for rinsing. Our well was in this part of the porch…a narrow encased cylinder that rose up through the floor with a long thin bucket that amazingly always brought up lovely fresh water every time it was lowered. Even after we had city water, we kept the well for several years. This area also had other uses. It was another place, in addition to “under the maple tree,” for shucking the corn and shelling the peas and butterbeans, for peeling peaches and apples and tomatoes, stringing beans and cutting up okra…all of these things being prepared for a daily meal or for canning. Often, usually on a Saturday evening, it was where my mother would pluck the feathers from a young “fryer” chicken that she had raised, and had no qualms about making it Sunday dinner. I did learn some things about cooking from my mother, but I never wanted to do that “chicken thing” and to this day I still don’t know how to cut up a whole chicken. Even with all the work areas, I remember the porch as a pretty place. It was boarded up to about waist level, with a ledge all round, and then screened the rest of the way. One of the first things we did in the spring was to prepare pots of flowers and ferns to sit on the ledge and these were enjoyed all summer. There are a few other memories of the back porch. Some of them are the times I remember “hobos” knocking on the screen door asking for food. The railroad ran at the back of our property, so it was not unusual to have these visitors occasionally. My mother always seemed to have something to give them. Another memory is both good and bad. For a number of years we had a wonderful black man, Sim, who helped my dad, usually during the summer months. We all loved Sim, yet he never came beyond that back porch. My mother would fix his lunch plate and bring it to him as he sat in a chair on the porch. It makes me sad to remember how we thought he was so different from us. So time has moved on. The house is gone, but the memories will always be with me. I’m sure we all can think back to our childhoods and our parents and remember certain things that characterized them. One of the memorable things about my mother were the aprons she always wore. If she was at home she was wearing an apron. I know that part of the reason for the aprons was that the laundry wasn’t done then as often as today, and she wore them to keep her house dress as clean as possible. But another reason for the apron was that it was her “carry-all.” That term was not around in her day, but it certainly did fit many situations. – Bringing in the eggs. We always had chickens so there were eggs to get every day. If she didn’t have her basket with her, she would carry them in her apron. – Carrying a spontaneous bouquet of flowers from her flower bed. – Holding clothespins as she took an item off the outdoor clothesline. – Carrying items to mend as she moved to a window or light to see better. – Quickly picking a few tomatoes or other vegetables from the garden when she didn’t have the pail with her. – Carrying baby chickens from the incubator to their pen. – Wiping away the perspiration as she labored over a hot, wood cook stove preparing a meal or canning. – Rolling it up about her arms when she was momentarily outside without a coat. – Wiping away her tears when she grieved over a loss. – Carrying in a few sticks of wood for the cook stove. – Using it to wipe off a speck of dust she spied on a piece of furniture. – Using it to clean her glasses. – Picking up her grandchildren’s toys left scattered on the floor. – Using it to play peek-a-boo with a grandbaby. – Picking up pecans from the trees in our backyard. My mother’s aprons were never fancy, just practical. They were always made from the same pattern — a long, gathered section with a bib at the top. Never just a half apron! I’m sure most of them were made from left-over dress fabric or from feed sacks that came in pretty patterns. My own experience in making an apron occurred only in home ec class. Unfortunately my mother’s wonderful skills at sewing and cooking did not pass on to me. My memories of her and her aprons will always be special. It would start early on a Sunday morning in June every year. I believe it was the second Sunday in June. My mother would have gotten up early, cooked breakfast for us, and then started frying chicken that she had dressed the night before (straight from the chicken coop if you know what I mean). Along with that she would also be preparing several other dishes and would have already, the day before, prepared a wonderful dessert. She would have all this done by around 9:00 a.m. and we would be ready to walk out the door soon after. We were headed to a church out in the country — the Friendship Methodist Church near Danville, Alabama for the morning service and then “dinner on the ground.” It wasn’t actually “on the ground.” Maybe it really meant “on the grounds” of the church. Either way it was meant, there were long wooden tables out under the trees that would be laden with wonderful food and it would take an hour or so for everyone to get their fill. I remember there was always a shaved ice truck there, so all the kids had red mouths for the rest of the day. This was the church my father had attended during his childhood, so of course there were lots of friends and relatives who came on this special day. This church was also where we went every year in May for Decoration Day at the adjoining cemetery. That will be another story. After everyone had eaten and visited, the singing would begin in the church. There was congregational singing, plus there were always visiting quartets from near and far and some really good piano players with them. Foot-patting, hand-clapping music filled the church for 3 or 4 hours. The open windows and the funeral home fans provided the only air conditioning. It was not unusual for someone to get too hot and faint. The day would end around 4:00 p.m. and people said their good-byes. Some not to see each other for another year, and some of the elderly who would never see each other again. Scenes and events like these have disappeared, but they left fond memories for those who experienced them. “Mama, please let me. It’s warm enough today.” Those were words I’m sure I spoke many times during my early childhood. Just because the early spring days were getting warmer, it didn’t mean that I could go outside barefoot. Times then were not like today when children wear flip flops all winter and think nothing of running out in the cold with no shoes. In my mother’s mind, the temperature had to reach a certain degree before my bare feet went outside. I suppose she was sure I would come down with a terrible illness if we rushed the season. I can remember so well the soft green grass that always appeared first in our back yard. I just couldn’t wait to feel that and walk on it. Another spring ritual at our home was the plowing and planting of our large garden. I’ve mentioned in another story Ada and Ida, my dad’s mules. He would use one of them (the best-natured one I imagine) to turn the soil and make the rows. The pungent smell of the fresh dirt made me know that soon good things would be coming from the garden. In those days the garden provided not only the summer meals, but winter meals that came from the vast array of filled jars stored in the pantry. My parents planted almost everything imaginable and then my mother would spend most of her summer canning and preserving the bounty from the garden. She not only canned just the routine things like beans and peas, corn and tomatoes. She made her own catsup, sour kraut, pepper relish, spiced beets, vegetable soup, and her wonderful tomato juice. In another area, not in the garden, there were two potato patches. One for Irish potatoes, and one for sweet potatoes. I always had to help with these plantings. It seems that we had a regular assembly line going. My dad would dig the holes, I would drop the potato piece into the hole (or in the case of sweet potatoes it was a little plant), and then my mother would come along and cover them up. It was always amazing to me to see how the potatoes then grew and multiplied underneath. As I think back to the many hours of hard work that went into raising and preserving our food, I wonder if we could survive today if we were suddenly forced into that situation. It would certainly be difficult; perhaps impossible. I am thankful for the experiences and the memories of those years. However, I am equally thankful for the wonderful farms that stock our grocery stores of today and make our lives so much easier. Growing up, there was never a lot of money left over for “extras” around our house. Even with just three people in our family, my parents were only able to meet the basic needs of that time. There was one “extra” however that my mother wanted me to have and I know she made sacrifices for me to do so. That was for me to have piano lessons. I was in the Third Grade when I began the lessons and continued until around the Tenth Grade. Early on, I realized that if I did my practicing after supper it would get me out of helping with the dishes. My mother would always say, “You go on and practice and I’ll do the dishes.” During those first few years of lessons and practicing I suppose I always thought I was tricking her — that I had found the perfect way to avoid that nightly dish-washing chore. But years later I knew that I had not tricked anyone. I was the one tricked. She knew what she was doing. With that regular practice I had learned to like, even love, music. I was never a great pianist, but I could play for enjoyment and for church and receptions. But mostly, the practice gave me an appreciation for all types of music — from classical to country — and an appreciation for working hard to attain a goal. I regret to say that I don’t play anymore — don’t even have a piano now. But the experience with music did make me want to be in a choir, which I have done since high school. That has been and continues to be an important part of my life. For women in the workforce today, it is probably difficult to imagine a time when women did not wear slacks or pant suits to work. As I think back to those times and then compare the dress of that day to the current trends, there is a world of difference. I began working at Redstone Arsenal in 1958. Looking back, I can recall some women arriving at the office wearing dress gloves to go with very fashionable dresses or suits. I never went to that extreme, but never considered wearing anything but a dress or skirt. In 1970 a major effort was made toward reducing fuel costs throughout the country. It was during that time that a suggestion was made to command headquarters that women be allowed to wear slacks to work since the buildings were to be kept at a lower temperature. I have attached a picture that shows me and two other ladies who “made the paper” when we first wore pant suits. In some ways I miss those days. I think we have become much too casual in the workplace and in the church. But, as with everything, times have changed. I can only wonder what the fashions will be in years to come. It was a job I had been wanting to do for a long time. A job I dreaded, yet one that needed to be done. We have been living in our current house since 1979 — a total of 32 years. When we moved into this house, the boxes that were marked “attic” were mostly from our previous attic. They promptly went up into our new attic as there seemed to be no time to go through the boxes as we were making the move. So, this past Monday, April 11, 2011, the day before trash pickup, we began that task — me climbing up the rather shaky pull-down stairs and Don standing below to catch me, yet stay out of the way as I threw things down. Finally, I worked my way to some of the boxes that came from our previous home’s attic. One of the boxes was now so fragile that it began to tear apart as I tried to move it toward the stairs. I soon realized that it was filled with clothes — baby and children’s clothes — our daughter Lorri’s clothes. How could I have forgotten these were up there. Realizing that I couldn’t get them down in the box, I began to pull them out and toss them down for Don to put in another box. I quickly came down, knowing that I wanted to see what all was there. The next hour made all the work worthwhile. It was a very melancholy time as I looked at all those little dresses and play clothes. Many of the beautiful little dresses were hand made by my mother who loved sewing for her granddaughter. I spent the next day washing and ironing some of the special pieces — some I will give to Lorri — and some I will keep for awhile. I was amazed they were in such good condition after being packed away for these 32 plus years. There are still more boxes up there. We plan another attack next week — if my knees have stopped screaming by then. I believe it was during the 11th Grade….which would have been the year 1955. Two friends and I decided to enter a talent contest, singing as a trio, to be held at our school. Not only were there contestants from our own school, but other schools in the county were also participating. So it was sort of a “big deal” with a full auditorium. I, and one other member of our trio, Sherry, had been singing together for a year or so in another trio. We sang at various churches and were even on the radio on Sunday mornings for a religious service. So we felt pretty confident about performing. Jo Beth, another classmate, was our other member for the contest. It was a long song, but we all knew the lyrics already just from singing along on the radio. But we did practice a number of times and felt we were ready. Our friend, Ruth Gayle, was to play for us. The big night came. We were on stage and singing our song — rather well we all thought. Then, suddenly, as we started into the last verse, we all three just went blank on the words. A soft hum was all we could do as we ended the song, hoping the judges would think we had planned it and were letting our pianist do a solo. But of course they knew what had happened so we were out of the competition. We were embarrassed, to say the least, but it was a good experience. And it gave me a story to tell some 50 years later. Another incident — I don’t remember the exact year, but I’m sure it was 10th or 11th Grade. It was summer, or early Fall — still warm enough to wear summer clothes. One evening my friend, Sherry, and I went to a fair there in our hometown of Hartselle. This was something everyone always looked forward to with all the rides and food and shows and to see a lot of people that we knew. The first hour or so of the evening went well. We met other friends and were having a good time. The one ride that we had not been on was the “Tilt-a-Whirl” — a sort of cage-like machine where you are strapped in and slung around in every direction, going faster by the minute. A few minutes into the ride, I realized that I was having a “wardrobe malfunction.” That strapless bra had changed locations and now was down around my waist. It seemed forever before the ride ended, but then I really didn’t want it to end either. What was I going to do? My friend was just dying laughing when she realized what had happened. With arms crossed, I hurried to a spot where she helped me get it pulled up again. By that time, I had experienced enough excitement (and embarrassment) for the evening, so we headed for home. After all these years, I still have a good laugh thinking about that incident. It was one day in the fall of 1960. It was the ride from the only home I had ever known in Hartselle, Alabama, to a new city….Huntsville, Alabama, and a new address. Donald and I had married on June 4, 1960. We had agreed before our marriage that we would live in the house with my mother for a while. We were both working at Redstone Arsenal and knew that we would soon need to find a house in Huntsville. My mother had been a widow since the death of my father in 1952. So from that time until I married it had just been the two of us. We were very close and naturally she depended on me for many things, especially transportation since she did not drive. By that time she was in her sixties and was still working at the elementary school cafeteria. After about four months of this living arrangement, we knew it was time to get our own place and make the move to Huntsville. So we did — to a small, partially-furnished apartment on Holmes Street in Huntsville. We had not yet purchased furniture other than our beautiful 18th Century mahogany bedroom suit. So on that Saturday in the fall of 1960, Donald rented a truck and he and his dad loaded the bedroom suite and headed for Huntsville, with me following in my car. It seemed a terribly long ride and I cried the whole way. I felt I was deserting my mother, yet I knew this was the right thing to do. After an hour or so we were in Huntsville at our new address, and Huntsville has been our home for the past 50+ years. They were huge — those two oak trees that stood out front of my childhood home. They had been there a long time and I never saw them any smaller. Always tall and stately, they had offered beauty and shade for many years. As a child I didn’t know to appreciate them. They were just a favorite place to play under — taking a rest after riding my bike, playing with dolls with a neighbor friend, drinking cool-aid, playing “dress-up”, pulling up the green moss to make a carpet for the play house — such simple things compared to what the children of today have. Our driveway circled around the trees, offering respite from the sun for the car we had and a place for my dad to do the “tinkering” on the car. It was also where he tried to teach me how to change a tire, which was not successful. Everyone who came to our home loved those trees. Sadly, when my mother sold the property years later for new buildings, the trees had to be cut down. Happily though, new oaks were planted and today they stand tall and stately — a reminder of times past. As I write this in 2016 and reflect back on the 1940’s, I have many good memories and some that make me sad today as I recall them. My parents, Urby and Ora Templeton, owned a nice home and 15 acres of land. This was located in the city limits of Hartselle, Alabama near Morgan County High School. At the back of our 15 acres of property, and the home in which I grew up, was a creek (called a “branch” by most folks). This creek flowed from somewhere north of town southward for several miles into a larger area of water. Across this creek was a small wooded area and then a “colored” community. As a small child, I always knew that the colored community was different from ours — that the people looked different, were treated differently, and their living conditions were different. Being so close to that community, my parents had learned to know quite a few of the residents, and some of them did odd jobs for my dad. One family in particular was “Uncle Dave”, “Aunt Penny” and Sim. We would sometimes visit their home, taking them something from the garden or some other things that my Dad knew they needed. Their little home was pitifully small but always neat and clean. I can still remember those visits and how glad they always were to see us drive up. This early introduction to people who were different from me has helped me to appreciate the life that I have had and to be more sympathetic to those who have had a more difficult life. As I think back to that day, I can still remember the smell of that new bike. It was light blue and came from the Western Auto Store. I don’t remember my exact age but it was probably 8 or 9 years. I knew that I was the last one of my friends to get a bike and I had learned to ride on their bikes. That bike saw many happy miles during the years I had it, even though I was very restricted about how far away I could ride. I was in an antique shop not many years ago and saw what looked exactly like “my” bike with dents and nicks and faded in color (Just like me!!!) It did bring up some good memories though of good times in the past. Worn smooth with age, the wooden floor creaks softly as Bill Brown walks over to extend a hand of welcome. Brown, a pleasant, jovial man of 70 is owner of J.C. Brown & Co. General Merchandise at 2400 Triana Blvd. Visiting this store is a visit into a past era. Still stocked with everything from horse collars to hair pins, the little store on the corner continues to serve loya1 customers. Brown explains that he graduated from the University of Alabama and also the University of Tennessee. “Then, I had a hitch in the navy for four years,” he adds. After his father’s death in 1939, Brown says that he came back to Huntsville and took over the store in 1940. A former, employee of, the store, Mrs. Mildred Moorehead, 62, of Triana Blvd. recalls her days at the store in 1937. “I worked part-time for $2.25 a week and thought that was big money.” Mrs. Moorehead says that customers did not come in the store and pick up the items they wanted. “They gave the clerk a list and he would gather up everything.” Chickens were sold from a coop outside, she says. “No such thing as buying a dressed chicken – you had to do that yourself.” The only thing, Mrs. Moorehead recalls, that you couldn’t buy at Brown’s was ice cream. “You had to go to the drug store for that.” She fondly remembers the cats that were always in the store and the big Warm Morning heater that “warmed many a backside.” “Those are all good memories,” she says. JC Brown General Merchandise store exists now only as a cherished neighborhood way-of-life and memory. The Brown store has been closed. Follow this link for a description.